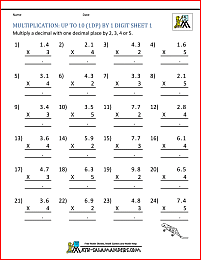 Welcome to the Math Salamanders 5th Grade Printable Multiplication Sheets. 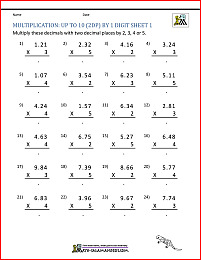 Here you will find a wide range of free 5th Grade Math Worksheets, which will help your child learn to multiply different decimals using a written method. At Fifth Grade, children enjoy exploring Math with these free 5th Grade Math problems and Math games. Children will enjoy completing these 5th Grade Math Worksheets and playing these Math games whilst learning at the same time. During Fifth Grade, children learn about factors and prime numbers. They build on their learning of long division and can divide numbers up to 1000 by two digit numbers. They are able to multiply decimals by whole numbers, and are able to work out powers of a number. Children are able to add and subtract fractions, decimals and mixed numbers, and learn to multiply and divide fractions. 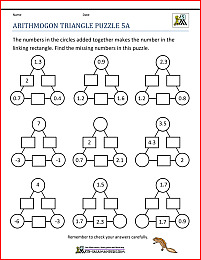 They are able to solve multi-step problems involving whole numbers, fractions and decimals. These free printable Fifth Grade Math Games, and other Math Worksheets for fifth grade will help your child to achieve their Elementary Math benchmark set out by Achieve, Inc. In the UK, 5th Grade is equivalent to Year 6. Here you will find our selection of Fifth Grade Multiplication worksheets designed to help your child improve their ability to multiply a range of numbers by a single digit. The sheets are graded so that the easier ones are at the top. 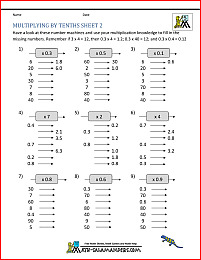 multiply a range of decimals (up to tenths) by a single digit. All the free 5th Grade printable Multiplication sheets in this section follow the Elementary Math Benchmarks for Fifth Grade. Need to create your own long or short multiplication worksheets quickly and easily? Our Long (and short) Multiplication worksheet generator will allow you to create your own custom worksheets to print out, complete with answers. 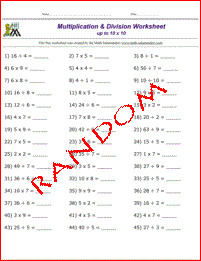 Here you will find a range of Free Printable 5th Grade Multiplication Worksheets. 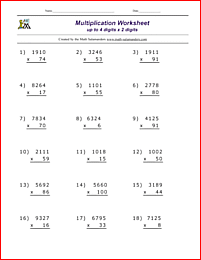 The following worksheets involve using the 5th Grade Math skills of multiplying, and solving multiplication problems. multiply different money amounts by a whole number. All the free 5th Grade Math Worksheets in this section are informed by the Elementary Math Benchmarks for 5th Grade. 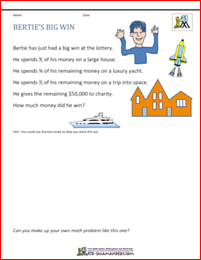 Here you will find our selection of free 5th grade math word problems. Each sheet is availabel in both standard and metric units (where applicable). Each sheet comes complete with a separate answer sheet. All the problems are based around 'real life' such as the planets, heights of mountains, or length of rivers. solve a range of problems including "real life" problems and ratio problems. All the worksheets help to support Elementary math benchmarks. These sheets involve solving a range of ratio problems. 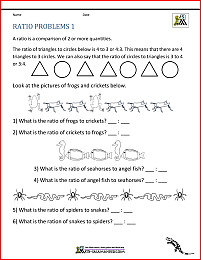 Here you will find a range of printable 5th grade math puzzles for your child to enjoy. The puzzles will help your child practice and apply their addition, subtraction, multiplication and division facts as well as developing their thinking and reasoning skills in a fun and engaging way. All the puzzles support elementary math benchmarks for 5th grade.